August 12, 2009 at 7:20 am · Filed under Amazing But True! 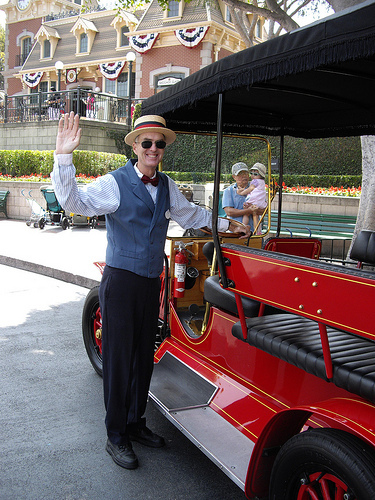 Steve, the most tenured driver on Main Street, USA at Disneyland, is famous for being in the fire truck, and only the fire truck. However, today I saw what I NEVER thought I would see in my life: Steve in the red car, wearing the period suit to match! Here’s the cartoon I did for Gilbert O’Sullivan that toured with him in 2008, and will be shown again at the Royal Albert Hall show in London this October. I figured since he had it on his web site, I can show it on mine. Until now, I have pretty much kept this thing under wraps.